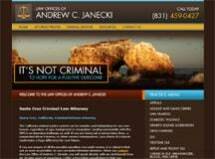 The Law Office of Andrew C. Janecki, located in Santa Cruz, California, provides dedicated criminal defense representation. As a lawyer with 20-plus years of experience, I can help clients facing a variety of issues, including DUI, license suspensions, drug charges, assault, theft, juvenile crimes and criminal convictions. When you hire my law firm, you hire me, Andrew Janecki. I am mobile, responsive, and aggressive in taking action for my clients. I continue to work every day to be the type of lawyer who works harder than my opponent, reacts more productively and serves people like you with total dedication. I understand how a criminal charge can wreak havoc on your life, and my law firm can take action and fight on your behalf. I will work aggressively and diligently to obtain the best possible outcome for your case. I will meet one on one with you to discuss your situation, explain your rights and evaluate your legal options. As an experienced attorney, I have the skill and know-how to advocate for you in negotiations and in the courtroom. If you are facing a DUI, drug charge or other criminal felony or misdemeanor charge, contact the Law Office of Andrew C. Janecki today for free initial consultation. From my law firm, I serve clients in Santa Cruz, Monterey and the Greater San Francisco Bay Area. I am focused on protecting your freedom and driver's license. As in so many other situations involving California criminal charges, taking fast action can be critical. I urge you to call me now if you have been arrested for a DUI. Breath and blood tests aren’t always accurate. Before you plead guilty to a charge of drunk driving, contact Santa Cruz DUI defense attorney Andrew C. Janecki today to learn how I can help you challenge the DUI charge against you. I am a Santa Cruz-based attorney experienced with the DMV. Fast, skilled action is critical to saving your driving privilege. Turn to a lawyer who knows area criminal courts and DMV hearings. Aggressive drug charge defense in the Santa Cruz region. To speak free of charge with a lawyer who will understand your drug case and drive tenaciously toward the best outcome for you, call the Law Office of Andrew C. Janecki. I have 20-plus years of experience in courts across Northern California. My exclusive focus has been criminal defense, protecting the rights and futures of my fellow Californians in negotiations, trials, and appeals.